We are fifty posts old! The number brings with it a milestone and a lot of pride! Our journey has only just begun and yet it seems right to pause for a moment and address this number. Hello FIFTY! To see Aalayam evolve into something beyond a mere idea that Supriya and I shared brings much happiness. Personally, it is also a guilty pleasure! On many weekend nights, I silently peel myself away from my family and retreat into the quiet recesses of my study to work on a blog post. What joy it is too! I feel blessed to have a platform to express my artistic side! Aalayam speaks to our love of writing as well and often our posts are wordy but if you linger long enough you will see that we write from our heart and consistently bring a lot of passionate energy into our posts. Supriya and I have a robust pipeline with all kinds of beautiful inspirations waiting to be shared and we hope you will stay with us as the next phase of Aalayam unravels. Fellow bloggers - thank you for letting us bounce ideas with you and for inspiring us, friends and family - thank you for cheering us from the sidelines and dear readers - thank you for propelling us on! And because the golden 50 deserves a golden post - I will shine the spotlight on Tanjore paintings - an Indian art form with glittering gold! How about that? (I kid you not!) 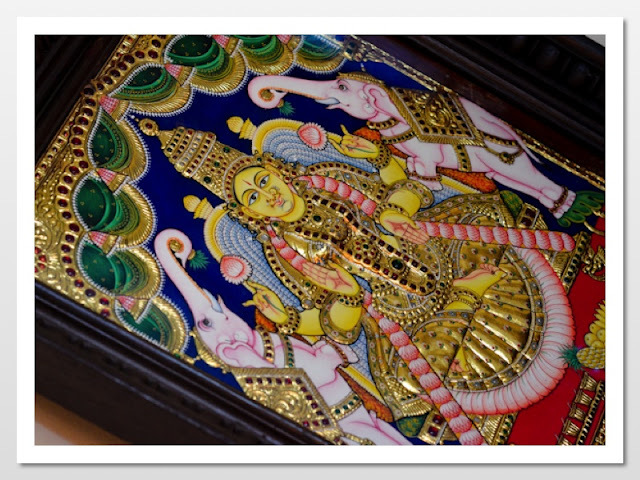 we found ourselves deeply immersed in the fascinating world of Tanjore paintings. The shimmer and shine of the semi precious adornments mesmerized us as we browsed through several aisles worth of neatly stacked Tanjore paintings. Walking from one store to the next and then back to the first one, we channeled our combined enthusiasm towards finding "OUR" Tanjore painting. That day is vividly etched in my memory! Eventually, we narrowed our choices down to two paintings. We wanted to bring them both home. But with a heavy heart and a big sigh I left Venkateshwara behind and brought home our Mahalakshmi. Vibrant hues, shimmering embellishments, artistic details - THE TANJORE PAINTING! She has been with us since! Life has demanded several moves of us both for professional and personal reasons. Each move brings with it an annoying feeling of newness. 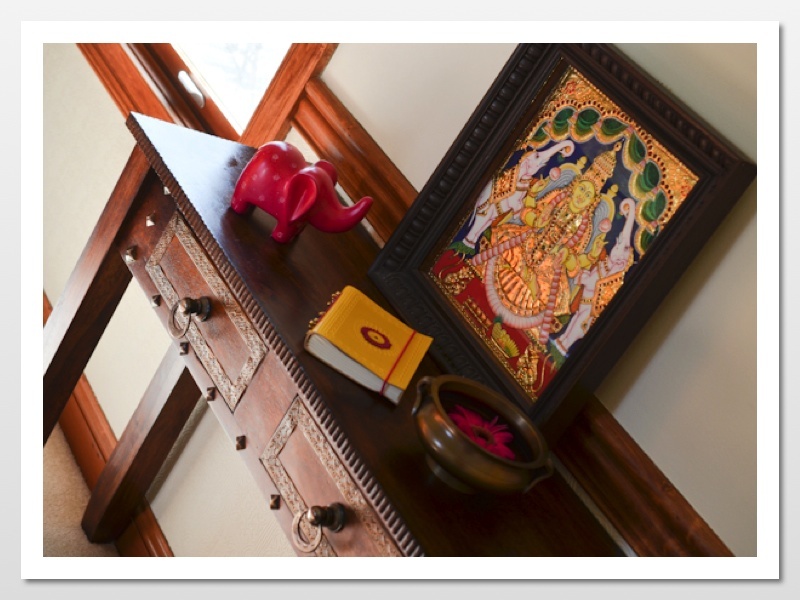 However, the unfamiliarity of being in an unknown place dissipates the minute I hang my Tanjore paintings up. It feels like home again in an instant and such is the comfort that art work breeds. It is yours and it defines your space! 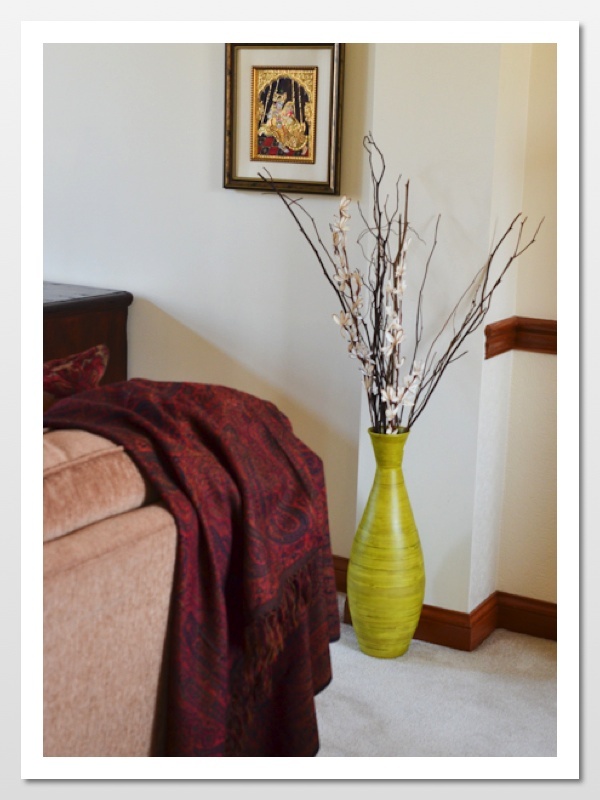 Another corner gets accesorized with art work -the ethnic kind! Several sources trace this art form back to the 16th century (I know! !, that was a long time ago) and the art flourished under the patronage of the Nayakas of Madurai. If you hear the term Tanjavur Oviyam or Palagai Padam (plank painting) just nod your head knowingly now - they are referring to Tanjore paintings, that's all! For more on Tanjore paintings, over to Wiki. 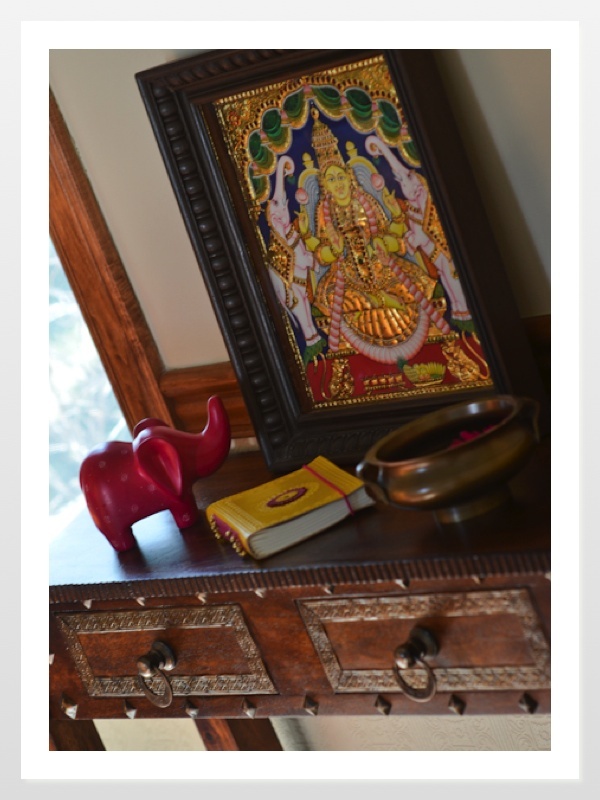 Since that trip to Chennai, we have added another Tanjore painting to our collection. This one a gift from our dear friends D and K and depicts Krishna playfully serenading Radha on the Jhoola. This painting reminds us of our friendship and the good times spent together. Krishna serenades Radha playfully in this rendition and it comes to life in gold foil! 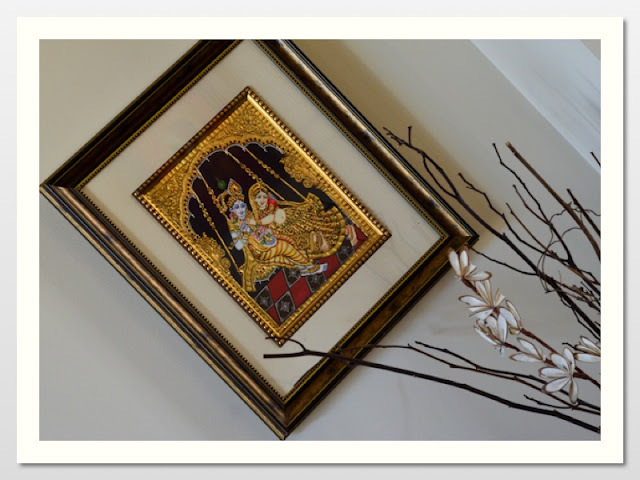 …….and we live with our beloved Tanjore paintings - they are tied to fond memories and our ethnic heritage and make our home OUR HOME. Do you like our spotlight series? Then I urge you to spend a minute browsing through our archives- we have already featured Warli and Terracotta and more! Next up - a travel feature. Any guesses on where we are going? Deepa..congrats on 50 th post and many more to cme...that Radha Krishna painting stole my heart...I do not hv any tanjore painting but I hv a wish to get it I. Future and that quote is so true..live with what u love. Nayana: Thank you - we've rather enjoyed the journey thus far and hope the future brings more fun and joy! My friend had brought back two tanjore paintings from India wrapped! and me and another friend had to pick one blindly - and I picked the adorable Radha krishna :) You should get one in a nice frame. With my lakshmi- the glass broke on the way here and I reframed it here in "museum glass" which cuts out all the reflection and the light and you can see the beauty of the painting clearly! Congratulation on your 50th post.. Your painting is so beautiful..love to have one like this ..reminder to myself..get one on my next india trip..:)..
Preety: Thanks for stopping by! You should get one without hesitation. These gorgeous paintings can work well in any decor style and if your style is more ehtnic then it's a 3 pointer!! Congratulations for your blogs 50th post.loved the mahalaxmi painting. Radhika : Thank you. We owe a our enthusiasm to readers like you! thanks for being part of this journey. I bought my painting several years ago - with two bags and a 32 kg allowance, i could afford to haul it across the atlantic. Now, it's harder..but there are several online retailers which sell Indian artwork...but would you buy artwork wihtout seeing it, feeling it - is the question? Radhika :) realized I forgot to address your comment about my foyer table. Thanks. It was my husband's find actually from a recent line at Pier One (can't remember the name - Heera, I think). I loved the metal accents on it right away! Leena: Thanks for taking the time to comment. We have more exciting features lined up so please do join us. Anandhi: Thank you! We love welcoming new people to this blog and growing the Aalayam family! Dear S-its-me : Thank you. That's what we had hoped our readers would say :). With 50 behind us, we are on our way to 100 now! Join us on this journey and we promise a lot of interesting reads along the way! Ramya: Thank you for stopping by. Please do join the Aalayam family.We will be featuring so many more global and local decor inspirations..it's exciting! thank you lakshmi! means much coming from you - you have an eye for beauty yourself!